Work on Memorial Sculpture to commence shortly. I have been working with a group known as Friends of the Tenth (FOTT). They have been fundraising over the last 12 months to raise money to create a memorial sculpture which will be sited near Somerby in Leicestershire. 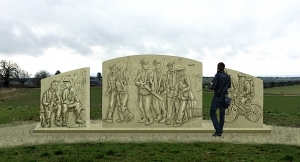 The memorial sculpture will pay tribute to the 10th Battalion the Parachute Regiment who spent time there and in the surrounding villages during the 2nd World War but were almost entirely wiped out during a fateful mission near Arnhem in Holland as part of Operation Market Garden in 1944. I have been told of many great stories involving the soldiers of the 10th Battalion during their brief stay in the area and many of the villagers and surviving soldiers have fond memories of their time there. However, of the 582 who departed for Arnhem, a mere 36 returned. Many killed, injured or taken prisoner by the Germans. The memorial sculpture primarily will honour the fallen and acknowledge the regiment. It will also recognise the time they spent in the area and reflect on some the stories that can be passed down for generations to come. I have been involved with this project for a couple of years while the FOTT have sought to locate an appropriate location for the work. They have also contributed to the design process and completed detailed research so that the names and details of the fallen, to be carved into the rear of the work are accurate. The sculpture will be carved in 3 huge pieces of Woodkirk sandstone at my Leicestershire workshop before being transported to the site in September for the unveiling. It will contain intricate carvings of soldiers and land girls and will depict some recognisable local landmarks that were important to the soldiers who were stationed in the area in 1944. The rear of the work will centre around the story of the Battalion and the names of the fallen. After years of preparation and fundraising, I am delighted to be starting work in a couple of weeks time.